Keystone Pipeline Construction Blocked By Federal Judge Judge Brian Morris wrote the State Department's analysis of the pipeline's potential environmental impact fell short of a "hard look" on several items, including greenhouse gas emissions. Shawnee Rae, age 8, among a group of Native American activists from the Sisseton-Wahpeton tribe protesting the Keystone XL Pipeline in Watertown, S.D. in 2015. Although the decision does not permanently halt the pipeline's construction, it nevertheless comes as TransCanada, the Canadian company that owns Keystone, is preparing to start construction in Montana, shipping pipe to various locations throughout the state, the Great Falls Tribune reports. The order stems from a lawsuit filed by the Indigenous Environmental Network and North Coast Rivers Alliance, which alleges that the State Department and TransCanada violated National Environmental Policy Act, or NEPA, the environmental law described in the order as "the basic national charter for protection of the environment." In August, Judge Morris ruled that the State Department must supplement a more thorough study of potential environmental effects of the pipeline. He had yet to rule on vacating the permit itself. In Thursday's ruling, Morris wrote that the State Department's analysis of potential environmental effects fell short of a "hard look" on the effects of current oil prices on the viability of Keystone, cumulative effects of greenhouse gas emissions, cultural resources and potential oil spills. "These omissions require a remand with instructions to the Department to satisfy its obligations under NEPA," he wrote. Morris also noted that in 2015, during the Obama administration, the State Department denied a permit to build the pipeline, citing environmental effects. At that time, the Department "relied heavily on the United States's role in climate leadership." Then came policy shifts in the Trump administration. Under President Trump, the State Department wrote "there have been numerous developments related to global action to address climate change, including announcements by many countries of their plans to do so" since the Obama administration's decision two years earlier. That statement falls short of a "factually based determination, let alone a reasoned explanation, for the course reversal," Morris wrote. "An agency cannot simply disregard contrary or inconvenient factual determinations that it made in the past, any more than it can ignore inconvenient facts when it writes on a blank slate," he continued. The pipeline was first proposed in 2o08. If built, it would transport around 830,000 barrels of crude oil per day from Alberta, Canada, and the Bakken Shale Formation in Montana to facilities near Steele City, Neb. The proposed U.S. portion of the pipeline would run about 875 miles through Montana, South Dakota and Nebraska. Another 1,200 miles would run through Canada. Four days after Trump was sworn into office, he invited TransCanada to resubmit its permit application. He signed an executive order supporting its construction in March of last year. NPR reached out to TransCanada early Friday for comment on the ruling but did not hear back by the time of publishing. "Today's ruling is a decisive moment in our fight against the corporate polluters who have rushed to destroy our planet," said Marcie Keever, legal director at Friends of the Earth in a news statement. "Today, the courts showed the Trump administration and their corporate polluter friends that they cannot bully rural landowners, farmers, environmentalists and Native communities." As NPR's Jeff Brady and Jason Slotkin have reported, "The oil industry and some labor unions have supported the pipeline, largely for the thousands of construction jobs it would provide. But those jobs are temporary. 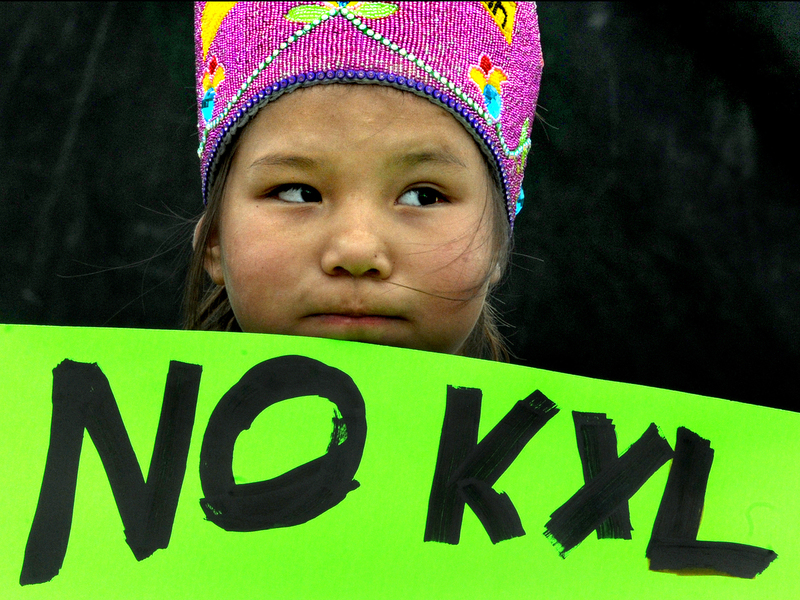 The State Department has estimated that once built, the pipeline will employ about 35 people."